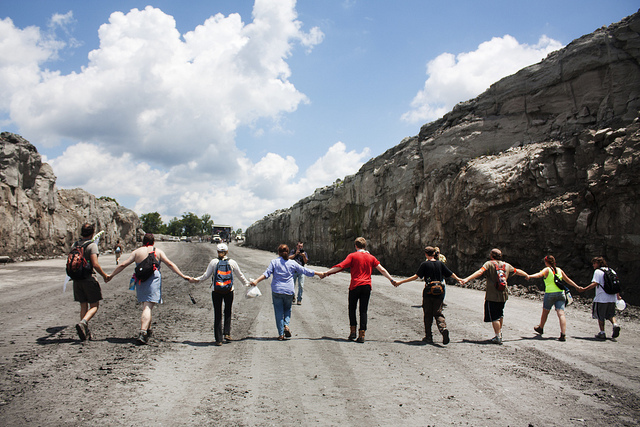 Protesters walking onto Patriot Coal’s Hobet mine in West Virginia’s Lincoln County. Photo via Mountain Mobilization. A new chapter was added to the storied history of resistance against the coal industry on Saturday with not only the largest direct action against mountaintop removal, but also one of the harshest crackdowns that anti-strip-mining activists have ever faced. More than 50 people taking part in the Mountain Mobilization in West Virginia — a week-long regional gathering meant to unite affiliated groups and allies — shut down Appalachia’s largest mountaintop removal site for three hours. Meanwhile, West Virginia State Police made 20 arrests, set bail at $25,000 per person and allegedly beat 20-year-old West Virginia native Dustin Steele while he was in custody. Police also forced those who didn’t get arrested to walk for four hours down a public road rather than let their arranged transportation pick them up, thereby subjecting them to harassment from pro-coal demonstrators. Waging Nonviolence spoke with Mathew Louis-Rosenberg, an organizer with the RAMPS (Radical Action for Mountain People’s Survival) Campaign, which put together the Mountain Mobilization. Louis-Rosenberg discussed the situation of the jailed activists, whether the crackdown is a sign of the movement’s strength and how it will affect actions in the future. What charges are activists being held on right now? As far as we can discern, their only charges are trespassing and obstruction of an officer. How long can they be held? They can legally hold people for as long as it takes them to get around to holding status hearings. Theoretically, they try — according to the magistrate — to hold them within 10 days. At that point, people would have the opportunity to take a plea agreement. But if the plea agreement was very unfavorable or they choose not to take it for some reason, they could be held until their trial, and that often takes months. To what extent can the charges be fought collectively, and how will the action continue through jail solidarity? In West Virginia you don’t have the option. We have never been granted a request to combine our cases into a single trial. Every person is tried individually, and we have tried on numerous occasions to request that that be different, and it has always been denied by the court. So the possibility of everyone going together in one big solidarity trial is not really on the table. That being said, our campaign has never really tried to impose a uniform legal strategy or encourage people to impose upon themselves a unified legal strategy. Some people want to get out of jail as soon as possible. Other people are comfortable staying longer. We just try to do our best to honor each individual’s request the best we can within our capacity. We always tell people that the West Virginia legal system is extremely chaotic and unpredictable. There’s really no way to know what’s going to happen. But this was definitely on the harsh end of what we expected. Can you explain the bail situation? On top of hitting them with $25,000 bails, they set bonds that were surety bonds only. What that means in West Virginia is that it can only be paid by putting up $25,000 worth of West Virginia property. Until we get a bail reduction hearing, it would take half a million dollars of West Virginia property to get everyone out. Nevertheless, we’re continuing to raise legal support money should we win a change in the bail conditions in court. Why was it set so high? One of the reasons, we think, is because we have several individuals who are victims of police violence. A common strategy is to hold the victims of police violence for long enough so that their injuries heal and are no longer documentable to protect the police from lawsuits. None of our people have been to see the medical staff — including Dustin, who is fairly seriously injured, complaining of walking and severe back pain. We got reports from other arrestees that not only did they hear Dustin being beaten, but they were also able to get a look inside the room, where they observed a significant amount of blood on the floor. As far as we know, no one has received any medical treatment whatsoever. If they aren’t going to be released, we at the very least want them to be transferred to a hospital as soon as possible so they can receive proper medical treatment and have their injuries documented by a neutral third party. Are law enforcement officers in West Virginia typically opposed to anti-coal activists? Frankly, we’re deeply surprised by this incident and by the response of the state police to this action. Prior to this weekend, we had never had any of our activists subject to police violence. We used to brag a little bit about how we operated in this really unique context because a lot of the state police were actually on our side. Not that they’re so nice to us or anything. But we never really saw the degree of police violence and intimidation that most people doing this kind of work face. We thought ourselves privileged to be working in this environment where we had never faced police violence, chemical weapons or pain compliance. We had a number of experiences where officers were quite friendly and let us know in variously coded ways that they agreed with us on the issues. So this really came out of left field for us, and we have any number of speculations about why things may have changed. We certainly took a more confrontational attitude in this action, in the sense that we announced publicly that we were going to take this action and called for as many people as possible to come. We refused to speak to the police at all before this action — I think for fairly obvious reasons — and this was the first time that non-compliance, by going limp, has been used on a large scale. I don’t know how many of our arrestees went limp this time, but it was a tactic that a number of people used, including Dustin. This is also the first time we’ve had a large, somewhat more public action since Governor Tomblin has taken office, and obviously the state police report directly to the governor. It doesn’t matter what individual state police officers think. If there was a chain of command coming down from on high to put the boot to the tree huggers, then that’s what was going to happen. Do you also see this crackdown as a sign of your movement’s growing strength? Absolutely. We’ve seen a number of strip mines close; we’ve had success in tightening down regulations and we’ve been building power. This is by far the most people who have participated in a direct action against mountaintop removal — and I mean direct action in the true sense of the word, as in acting directly to stop the thing from happening. There have been larger symbolic actions and demonstrations, but this is by far the largest number of people — by four times — that has ever gone on and certainly the most bold and public announcement of any such action. We got a great response, and people came from all over the place, including quite a number of people who had not come before and had not worked on this issue, but felt moved to respond to the call. The folks who came were primarily working on other issues, such as fracking, and coal export and the Powder River Basin issues in Montana. A bunch of people working with the Pennsylvania and Ohio anti-fracking movements were involved. We had people from Occupy D.C. and Wall Street. There was also one person working with the tar sands blockade in Texas. So it really demonstrates the growing power of our movement and the growing unity within the movement against extraction. The opposition is scared of us. This is what happens when you’re effective. We’ve seen this time and time again. You can look at parallels in the labor movement and civil rights movement. In addition to the scare tactics used against us at the action, there has also been constant harassment at base camp. A couple of nights ago there were shots fired, but not at anyone. They’ve been felling trees across the driveway from the property and laid down a spike strip at one point — a piece of rubber with spikes sticking out. It’s really been a very intense situation, and I hope people through all this can understand that it’s because what they did was so important and so effective. I hope that people who came here and had legitimately traumatic experiences aren’t discouraged from participating in this fight. There’s a wide range of experiences, to be honest. A lot of people are walking out of this feeling empowered, but there’s also a lot of people — and most of those folks have left already — who did not have a positive experience. It’s been a really mixed bag, and what we really hope is that we can continue to reach out to the wider movement and explain and contextualize those experiences for people, and that ultimately it will build the movement. But it’s a dangerous time. They use these [scare] tactics because they can work. So we’re looking at various ways to hit back of course. We’ve been frantically on the phone with any number of lawyers all day long trying to arrange bail reduction hearings. We’re studying our options. We’re not going to take this lying down. We’re communicating with the contacts we have that are connected to powerful people at various levels of government to see if we can get a response there. It’s going to be interesting to see what evolves over the next week or two, but certainly organizers are doing anything but putting our heads down and our tails between our legs and going home. We’re working as hard as we can to figure out how to make sure that Saturday is a day they regret, and we’re committed to that. Will you be training people differently in the future? I think this is most certainly going to change the way we train people to take direct action. As always, we try to make our trainings as specific to the context we operate in as possible in order to prepare people as well as possible. All we can do is base that on our prior experience, and our prior experience and context has changed. And that has certainly changed the way we train people. We have not emphasized tactics responding to police violence both physically and in other ways because it has been so completely outside of our experience until now. And I think there’s going to be some interesting conversations among the organizing body about how we do this in the future, how we prepare in the future and how we talk about the environment that people are walking into. Would you say the main goal of this action was to build broader support and solidarity? This is what we would call a movement-building action. I tend to think that there are two kinds of actions. One is a very targeted pressure campaign, like the one Greenpeace recently ran against Apple to get them to move their cloud computing off of coal-fired power. There was a very clear target, a very clear ask and a very clear series of actions directed at messaging and achieving that goal. And that method can be very successful — a sort of tactical pressure campaign. But this is a different kind of action. This is the kind of action that grows movements, and that’s a big part of our goal. We began doing aggressive, on-site direct action because we were asked to by local leaders. It wasn’t our idea. But after years of folks largely from the outside taking these kinds of direct actions, we see more and more Appalachians gaining the courage to step up and use more confrontational tactics like we just saw at the end of the week in Washington D.C. There are individuals that are really strong participants in this movement who say they always thought mountaintop removal was bad but had never taken the next step of getting out there and doing something about it. Oftentimes, they just don’t have that luxury due to circumstances in their lives. They have to take care of their health and poverty. We’ve really seen over the years just how much hope and energy that this gives to local folks fighting mountaintop removal. And we hope that, by taking more radical actions, we open up space behind us. If we can do things like what we’re doing now then maybe it won’t be as scary for folks to write a letter to the editor, to speak out in their community, to file a complaint, to go to D.C. and do a safer action like sitting in at a congressional representative’s office, which just happened. What are the types of next steps you are foreseeing, as part of a larger strategy building off of this weekend? My hope is that we have the fortitude both within our own organizing crew here and in the broader movement to continue to push for large public actions and for building sustained resistance. I think we all agree that where direct action needs to go in this movement is toward longer and more disruptive actions — obviously, keeping within our strict code of nonviolence. We don’t even accept verbal violence within our movement. Our nonviolence code includes not screaming at miners. But within that context we need to find ways to continue to push the envelope and have more sustained disruption. In a perfect world, we would have the people to pull off Tim DeChristopher’s vision of sending 30 people into a mountaintop removal site every day. Clearly we have not reached that scale in the movement yet. But that’s a dream to shoot for. And we felt that this action was the first step along that path. I hope we can find ways to continue toward that vision as safely and effectively as possible. Because the protesters attached themselves to an explosives truck, they may also be facing federal charges, because the explosives are governed by the ATF and Homeland Security. Yes, and interstate highways are also governed by Interstate Commerce Acts and other assorted federal laws and agencies. But you don’t get a federal charge when you get pulled over for a speeding ticket. The National Council of Churches has said 2012 is the year to end mountaintop removal coal mining. It’s great to see growing unity around this priority. Earth Quaker Action Team’s 200-mile walk across Pennsylvania to confront coal funder PNC Bank also showed growing unity. Thanks for the report on the growing escalation of the struggle (on both sides) in West Virginia in July. The RAMPS nonviolent discipline puts the earth-destroyers on the defensive, and it’s not surprising that they react. Congratulations to people standing up for the children and the mountains!